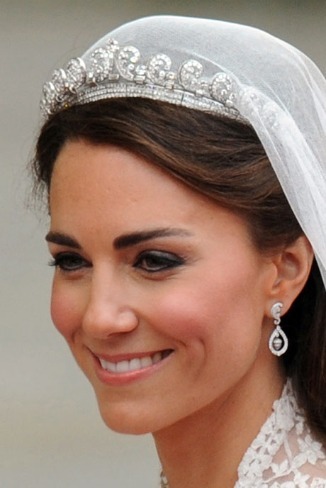 May Jewel of the Month 2011 - Kate Middleton "borrowed", the Queen's 'Halo' tiara for her wedding day, Friday April 29, 2011, made by Cartier in 1936, purchased by The Duke of York (later King George VI) for his Duchess. The antique tiara fits in beautifully with the vintage style of her dress. It's not just Mr Cartier's Big Cat family of jewels that roar quality. 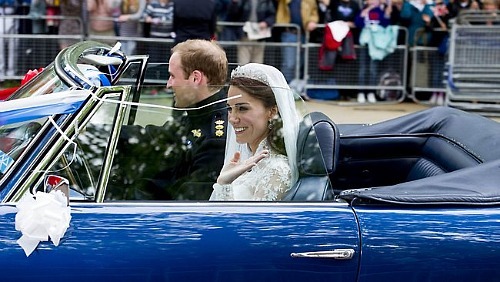 Did you see the Halo Tiara by Cartier, Kate Middleton wore on her wedding day, lent to her by the Queen? You couldn't miss that Tiara - right? It is the epitome of elegance and grace; a crowning statement. Kate's wedding attire, including the Tiara carried a carefully crafted message and spoke to the world in the most powerful language possible. The dominant motifs that appear in Kate's diamond wedding jewelry are acorn and an oak leaf. Described as a "low-key" tiara by Jewelry Editor, the message Cartier's 'Halo' Tiara delivered to the world was nothing short of high impact. It roars quality and is a historically important jewel. The 1936 "Halo" Tiara, made by the House of Cartier, jeweller to kings, was presented to Princess Elizabeth (now The Queen) by her mother on her 18th birthday. The Tiara was originally purchased by the Duke of York (later King George VI) for the Duchess of York - later Queen Elizabeth, the Queen Mother - on November 18, 1936, three weeks before he succeeded his brother, King Edward VIII, who abdicated for the Love of Wallis Simpson. The "halo of light" was also worn by Princess Margaret, the Queen's sister in 1955, while Princess Anne, the Queen's daughter appeared wearing the Tiara on several official ceremonies in the 1970s. 20th C. Cartier Jewelry is the ultimate high-end Edwardian style Jewelry while The Cartier Big Cats Collection, is the quintessential landmark in fine 20th Jewellery. It was first commissioned by King Edward, for the Love of Wallis Simpson. Cartier crowns, include The 'Persian' Crown commissioned in the same year as the 'Halo' of 1936, and made from platinum. The principal designers at Cartier managed to capture, in their jewels, a light airiness of delicate platinum workmanship. The crown of Jewellers is world renowned for their crowns. Kate's pear-shaped diamond earrings by British company, Robinson Pelham Jewellery Ltd were designed specifically to match the Cartier Halo Tiara. The earrings were a present to Kate from her parents, Carole and Michael Middleton on her wedding day. One pave set diamond acorn suspended in the centre of each earring, fell from a delicate oak leaf. The design of the earrings is such, to match the design motif in the Tiara and also echoes the Middleton family’s new coat of arms, which again includes acorns and oak leaves. Two gold stick pins, one with a single gold acorn at the head and the other with an oak leaf, are also worn by the father of the bride, Michael Middleton, and the Bride's brother, James Middleton. The Oak Tree is the most iconic of British Trees and a national emblem of England. From King Charles II to Robin Hood, it is shrouded in myths and legends. Featured strongly in art, architecture and heraldry; a sprig of oak leaves and an acorn is the symbol of the National Trust for England, Wales and Northern Ireland.